Kashmiri cuisine has been something that has always intrigued me thanks to it’s interesting history and it’s strong affiliation towards meat, especially mutton. Though I haven’t been up north to Kashmir my father has and one thing he always raved about was their food and their excellent quality of meat. While I was wondering when I was going to get my hands on some of this, I was invited to Curry Town at The Savera Hotel for a Kashmiri Food Festival and it was obviously an offer I couldn’t resist. 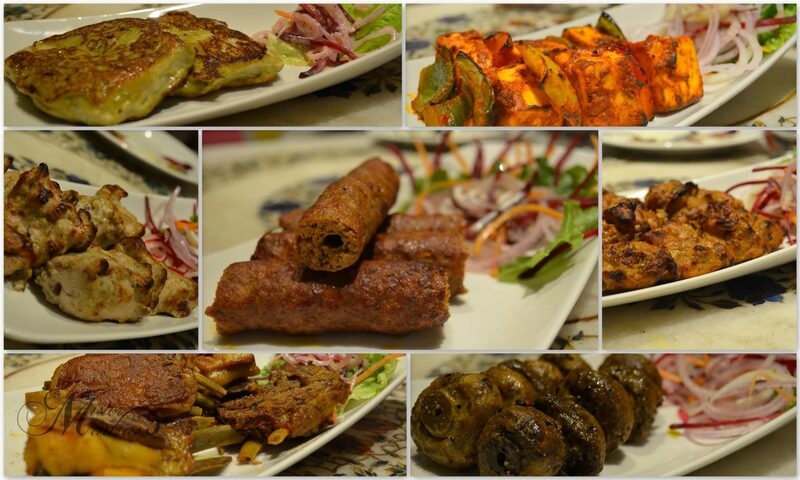 The Kashmiri Food Festival is designed by Chef Rehman Mujeebur. He has hand-picked the dishes for this menu and has come down all the way to Chennai for this festival. He’s an expert in Awadhi, Rampuri, Typical Mughlai, Hyderabadi, Kashmiri, North West Frontier, Persian & Turkish Cuisines and so if there was someone who was going to teach us more about the Kashmiri cuisine, it has got to be him. He is associated with many star hotels across the country such as J W Marriott, Oberoi, Hyatt, Hilton, Accor, Radisson, The Park, The Lalit, Intercontinental Group, Sarovar Group, Ramada and etc. So it was indeed an honour to meet a culinary guru like him and learn a lot from. 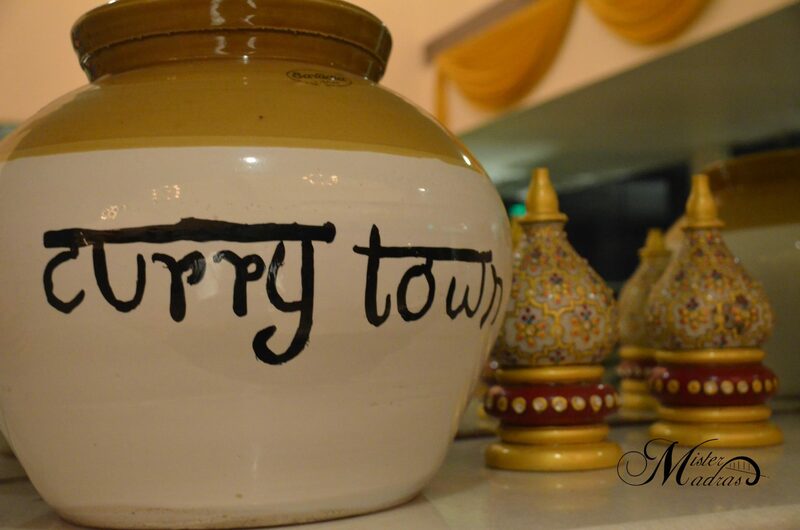 The Kashmiri Food Festival is happening at Curry Town in The Savera Hotel, Mylapore. The Savera Hotel is one of the most well known star hotels in the city with a heritage of it’s own and over the period of time it has become a landmark on it’s own. It is located right below the Cathedral Road bridge and it is right next to The Woodlands. There is ample car parking space and they have valet parking service. The bike parking entrance is through TTK Road. Curry town is located at the 11th floor. The lift is only till the 10th floor and Curry Town welcomed us with it’s colourful décor right from the staircase that leads to the 11th floor. Wall hangings denote the different cuisines this restaurant serves and the staircase ends at the entrance of Curry Town which is graced with a humble rickshaw. Right next to it is the pathway to a restroom that’s ornamented with a classic white saloon door. Curry town has three different seating spaces, closed, open and semi-open. Undoubtedly, the outdoor seating was the best. Spacious seating, perfect lighting, breezy atmosphere and a lovely view. Add a candle light to it, presto, you’ve got a perfect romantic getaway in the heart of the city. The semi open seating is the one at the far end of the restaurant which gives the feel of outdoor seating along with the airy feel but a ceiling on top makes it a perfect spot round the year. The intricately designed white walls with elaborate paintings in contrast yellow colours feels so apt for the cuisine they serve. Indoor seating looks like a perfect example of fine dining. Chandeliers adorn the ceiling while bright yellow and pink coloured couches with plain white table dress up the floor. 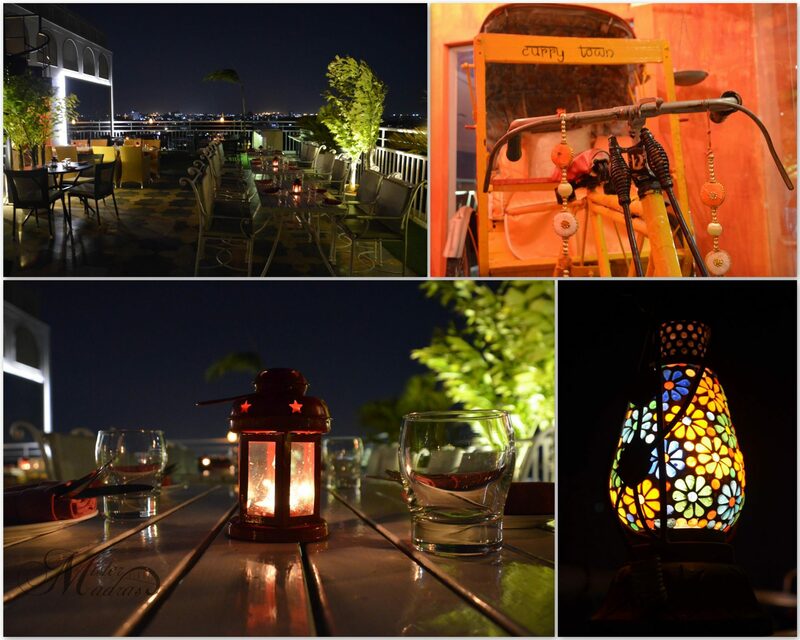 We were served a plethora of items and Chef Rehman was checking on us regularly to get our feedbacks. They have made a special menu for this festival and it looks brilliant. Given below is a list of items we tried and how they fared. 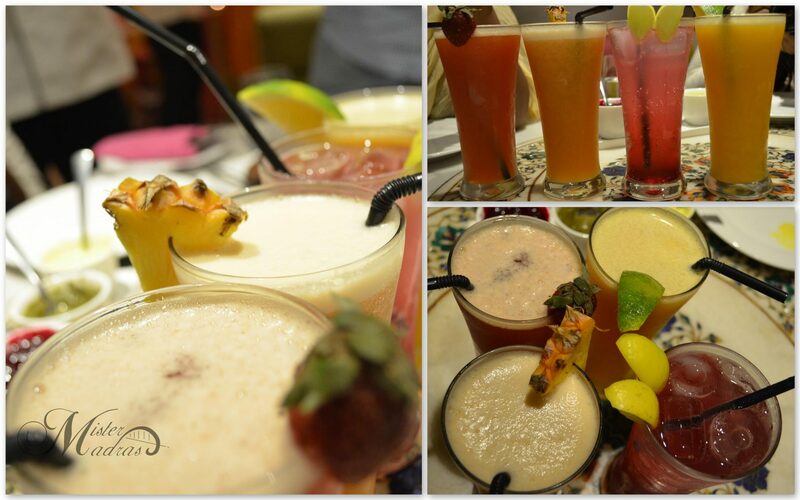 Drinks aren’t a part of the Kashmiri Food Festival but we ordered a couple of mocktails from the drinks menu. They have five mocktails in menu and ironically we were five in number which made it perfect for us to try all their creations. Cardinal Punch – Orange, Lime and Cranberry juice in soda gives it a visually stunning look. But tastewise, it was very carbonated making it the least favourite. Spring Fever – A medley of citrus fruits and mango but felt the mango taste to be overpowering. It was pretty good. Strawberry Cooler – One of the best mocktails we tried that evening. It was a bit too dilute for my liking but tasted brilliant. Fruit Punch – This is what I ordered and I completely loved it. So much that I went for a second serving. Shirley Temple – Shirley temple is again a citrus concoction which was very diluted and didn’t suit our palates. From what we had, I’d say the starters were the star of that evening. To begin with, we were served spicy papads with beetroot sauce which was very interesting, mint sauce which was the usual and a spicy sauce made from yoghurt I assume. Out of these, beetroot was my favourite for it’s sweet flavour. Rajmah Akhrot Kababa – A Galouti kebab made from Red Kidney Beans and Walnuts. It had the perfect melt-in-the-mouth texture and walnut provided the needed crunch. I liked it but a true vegetarian would love this dish. Tsaman Warimasala Tikka – Paneer marinated with spices is a standard across our country and Kashmir isn’t an exception either. The paneer was soft and was cooked to perfection. Tasted heavenly. Jhelum Khumb Masala – Mushrooms marinated in yogurt and pickle before being cooked in the tandoor. This dish is one of the most juiciest mushroom starters I’ve ever had and I loved it. Wazwani Aluv Tukri – Potato chunks that were marinated in chilli yogurt. I found the chunks to be bigger than what I’d prefer. It isn’t a dish I would order again. Kukur Dudhiya – Chicken marinated with cream, pepper and nuts. It was very creamy and rich making it my favourite starter of the lot. Kukur Lebabdar Tikka – Chicken tikka made from red curry. This is a spicier dish when compared to the one above and the meat was succulent thanks to the perfect cooking. It was really good. Gadh Dhaniwal Pasanda – Seer fish has it’s own delicious taste making it the king of fishes in Indian cuisine. Get a perfectly filleted piece of it and cook it with yogurt and herbs, what we get is a juicy dish that’s mild in flavour yet becomes a crowd favourite. Maaz Seekh Kebab – Minced lamb with chickpeas and spices makes this dish picture perfect along with some well garnished salad. But tastewise, it was pretty decent. Tabakh Maaz – Underspiced lambribs cooked flawlessly. The seasoning hadn’t seeped in through the fat making it blander as we slice through the layers. Didn’t find it too appealing. 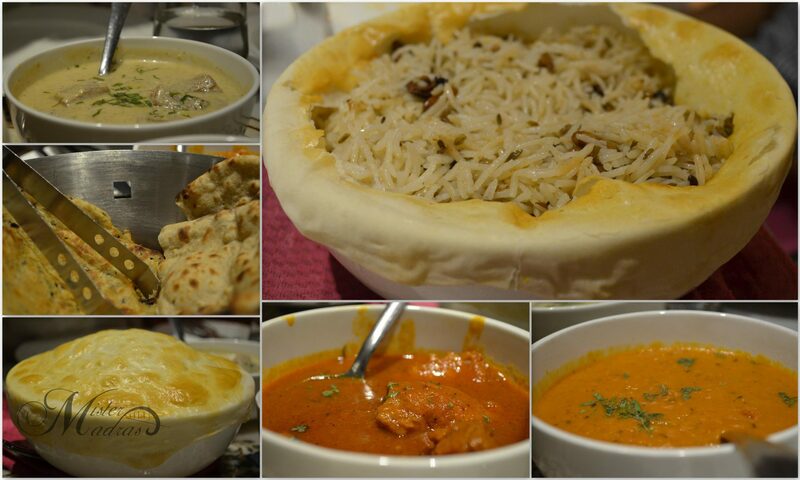 For mains, we predominantly stuck to breads which were Lavas and Kashmiri Naan. Lavas is a roti made in clay oven from poppy and Kashmiri Naan is loaded with nuts giving it a sweet taste which also makes it a must try. Both the breads went excellently well with the gravies. Kashmiri Meva Pulao – I don’t remember the last time I enjoyed a veg pulao. This dish was filled with whole nuts and saffron making it heavenly aromatic. It’s subtle flavour made it a perfect pair for Rogvan Josh. Rogvan Josh – This is the most signature dish of Kashmir and it’s always a delight to enjoy a warm cup of Rogvan Josh with some breads. Made from lamb and red onion curry, this was a blissful dish and something we all loved wholeheartedly. Dal Wazish – Dal tendered in milk and cooked with tomato and coriander. My favourite among the vegetarian mains, this dish was so soothing along with a piece of warm bread. Nadur Yakhni – Never did I know that Lotus Stem was famous in Kashmir and my previous experience with it is in it’s fried crispy state that I loved. This dish had a yogurt base making it a creamy gravy, perfect for pulao. But I personally didn’t like the lotus stem because of it’s stringy fibres and I enjoyed just the gravy. Desserts have always been an integral part of North Indian cooking and I’d be surprised only if I didn’t find any in store. 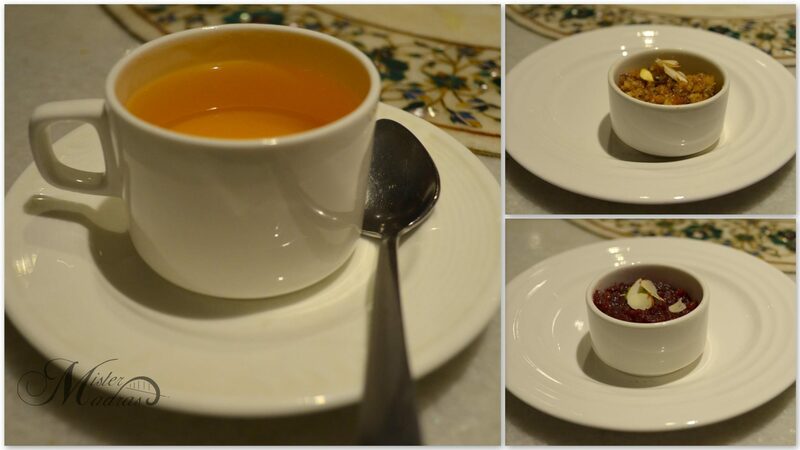 They had three options according to the menu, Shufta, Pista Phirni and Chukander E Afroz. Since we’ve tried Phirni a number of times, we opted for the rest of em. Shufta – Halwa made just from paneer and dry fruits. This is as sinful as a dessert could get and it was lip-smacking. Chukander E Afroz – Beetroot halwa is yet another simple and easily available dessert but what they served here was in another level altogether. The sweetness wasn’t overpowering and this made it an awesome dessert. At the end we were served cups of Kahwa, a traditional green tea that’s famous in Central Asia. Infused with cinnamon and cardamom, it’s warmth and soothing made it a fitting finish to our grand meal. Overall, we had a wonderful evening thanks to some awesome company and even amazing food. Service was excellent and Mr. Chandrasekhar who served us was very friendly and courteous. It was definitely a great experience to be served by one of the most recognized chefs of the county and his team. A special thanks to Mr. Sampath Kumar, the F&B Manager of The Savera Hotels. The Kashmiri Food Festival is something that is very hard to come by down here in the south and it’s a great opportunity to catch up with a cuisine from the other end of our country. This is something that shouldn’t be missed!